or are colorful public figures like John McAfee good for the effort? McAfee Antivirus inventor John McAfee’s announcement that he will run for President as a Libertarian has sparked a lot of conversation in some large media properties. Many of the comments, interestingly enough seem to criticize the LP for being on the sidelines with guys like McAfee. When poked, it is my experience that these detractors are largely not in the LP, but in the GOP and are just doing their routine sniping. It brings me to ask the question: Are we really sidelined when we run colorful characters in the LP? Even with all of this reading, at this moment I do not know much about the guy. I do not know if he would well represent the philosophy and spread it, but I do know something about how the LP operates, and “from the sidelines” is where the LP thrives for now. The LP does operate from the sidelines. It seems to me that it is only allowed to exist because the powers that be, have to maintain an illusion of the principles encoded in the first and strongest constitution based on freedom ever written. It would have been easiest to simply outlaw the LP, and today that effort seems to be gaining traction under the guise of National Security but it has been hard to do and not get exposed. Instead they just change the rules of elections whenever there is a gain by any independent movement. By the rule of law, the sidelines is where the LP must play. 1) We change our system to be more parliamentary in nature. 2) One of the corrupt so-called parties, falters in it’s ability to turn out even the tiny minority they need to keep their power and it collapses. The first option is too foreign to people in the US and is not supported in the Constitution. Most people seem to agree with me thinking that this is not likely going to happen without a catastrophic crash of the economy and political structure. The second option, however, is looming. Both parties are ruled far from the voters and in controvert to the wishes of their base. The Republicans are nearly defunct. This is especially obvious in states like California where they are no more than a zombie institution locally, and an ATM machine for the east coast masters of the party. They have been rigid and exclusive for decades, pushing out all who disobey. Goldwater scared the crap out of them. The Democrats are far less rigid than the GOP keeping their leadership in place in a complex of winks and nods. Their structure is more tolerant of converse movement at the top as the base is allowed to move more or less on its own. Control happens through less direct routes than in the GOP. But that same structure makes flexible makes them more prone to pieces breaking off on their own. The LP is on the sidelines and fighting the good fight. 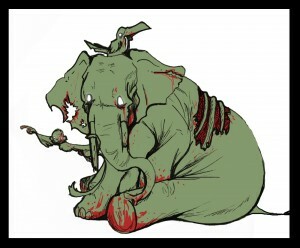 One day there will be a shake-up; likely shattering the GOP. At the same time an influence vacuum will form that will detach large pieces of the Democrat’s base as the people on top, fat with power, eschew the need to cater to the inconvenient. At this time, a new “team” will try and form to take the field. Some think that this change is imminent in just two presidential cycles. I think that a Donald Trump could make it happen in one. One thing is for sure: A minority of people in the US are eligible to vote; a minority of the eligible bother to register; a minority of those registered go to the polls – and elections are won with tiny percentages of the population. The sham is actively falling apart… right now. It will be after this time that the LP has it’s chance. People will be seeking “genuine” and “honest” representatives like people who are attracted to Bernie Sanders exemplify. If the LP has maintained their “pure” message the “kookiness of dissent” becomes “the wisdom of the people” and society will move forward toward freedom. The other outcome that might happen is that we become a single party system officially. What is really scary is that this is our current trajectory as I see it. The GOP and Democrats are already shells for the same interests. Those interests have no want to have to keep paying twice the “cost of influence.” There will be a lot of pressure to keep the GOP extant but tiny as the token “minority party” institutionalized in the constitution and legislative processes. We are unprepared. The LP was at its strongest when radicals were out front and making noise. Where is the Doctor Demento’s of the 21st century in the LP? 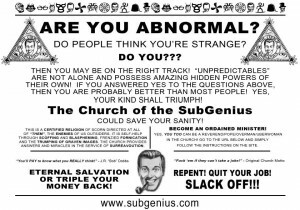 Where is the Church of the Subgenius and the other such counter culture groups? I can tell you. They were chased out by people who were afraid of statements like “peanut gallery” – suits, who following the examples of the dragon they once fought, took a page from the GOP vs. Goldwater and started purging the “unseemly” activists and “povertarians” from the party. In effect they chased out 90% of the party. So, I would recommend that we embrace every colorful character that will sell the philosophy; that we “own” the sidelines with an excellent show. We need people like McAfee to fill the roles of the likes of Aaron Burr, George Washington, and Benjamin Franklin. People with the courage to stand up are often people who have colorful pasts. People who know how to make waves do not learn that skill by having led an unassuming life. Look up George Washington’s early career for instance or Thomas Jefferson’s constant battle with solvency. We need showmen and risk takers, and men with views askew that highlight truth. We need people to look, to remember our name and the earnestness behind it. We need people who want to join in the circus that is an insurgent movement, we need to make it fun, and we need to make it effective in one thing: Winning people over to liberty and building our base. From that base, everything else naturally follows including elections. If we do not do this duty; if good liberty loving people do not get on board and start making noise along with us; if they give into irrational fears of not getting elected; if we reject the unsightly or unseemly and lose their support: The fascists will immanentize their single party strategy and true liberty will be lost from its first and last vestige on Earth. Several questions worthy of discussion are raised and I invite your comment: Is McAfee someone who will represent the philosophy? Do colorful people spoil the chances of the LP getting elected. Does the LP need to better embrace the strange? Can the LP be effective for liberty even when it does not take offices? I invite your comment! I’ve always been amused that people opposed to politics had a party, although I’ve given a reasonable amount of money to libertarian candidates. I always gave the money to support outreach, knowing Harry Browne, et al. could never win. I think folks like McAfee would be great. Successful folks, not professional politicians ( or serial bankrupts like Trump) with real stories to tell. And I could support him with no fear of violating NAP, because he could not get elected! Guilt free politics, I’m in. Certainly I am happy he has announced an intention to seek the LP nomination. If I manage to be a delegate this year, I will give him fair consideration along with the other candidates. I can support a showman or controversial figure so long as she promotes the NAP and can persuasively advocate political solutions consistent with non-aggression and equal rights, right or left. McAfee is left-leaning but “close enough,” clearly in the libertarian quadrant of the Nolan Chart, and may well learn to express his concern for the poor in a way that does not offend the NAP. Someone with the life experience of McAfee and concern for the oppressed classes may well be better positioned to capture some of the momentum of Bernie Sanders. It’s a very positive development. I happened to be on Ambergris Caye in Belize when McAfee was accused of murdering his neighbor towards the end of 2012. I will not repeat what I heard from those that know him since I have no proof of the veracity of the stories, but if even a fraction of them are true, this is a man without principles. @nancyrhyme without repeating rumor, can you classify what your heard of McAfee as characterizing a man who respects no law but his own, or as a man who uses violence to get what he wants? “No Principles” can mean a lot. The United States was founded and built by pilgrims, pirates and pioneers all of whom had very different sets of morals from each other except for one common thread: They sought to rule themselves and seek their futures and fortunes on their own terms. That struggle can be a pretty hard knock life especially for the “pirate” personalities who cotton little authority than their own. Belize is a pretty “wild west” sorta place. Not that there is shoot-em-ups every day, that Hollywood myth didn’t ever exist. But in the 19th century, the west was full of “government” that worked hard for East Coast interests, to consolidate power and wealth for them with the army strong arming their moves. Most people had to rely on themselves for their own protection including from government. The Caribbean nation of Belize has its’ own pirate history. It is a playground for the wealthy, a place of opportunity for those who live off of the wealthy, and I cannot imagine that the government is any less attuned to getting their share from wealthy ex-pats through its own tactics. I keep hearing and reading about the “cloud of controversy” McAfee left behind, but I have yet to hear anything except that he was a person of interest in the investigation of his neighbor’s murder and that he claimed Belize officials were using the opportunity to leverage the circumstance against him as he had made enemies there. For what I know of it, I could easily chalk up the incident to a “pirate skirmish” for which there are no details for me to consider, only saber rattling after. Looking at his all the interviews, I cannot see how he plans on getting the LP nomination. The Party is a caucus party which means you have to turn people out at convention to get it. McAfee says he is only going to engage people online. I don’t see that translating.